Headphone:Insert headphone if you do not want to disturb others when listening. -Mode:Press to change source between MP3(USB/SD) AND FM.In FM mode,press and hold to auto-search and preset station frequency. Plays mp3 music. Simply copy/paste the mp3 files from your PC to the MP3 player and you are ready to go. 1 x MP3 Player. Can also be used as a Micro SD/TF card reader. Supports USB 2.0. Slick stylish design in a compact case with clip. Features: Mini size and light weight, easy to carry FM/AM Radio MP3 Player(USB disk &TF card) Automatic search and store the radio station Type in the number to search for your favorite radio program or music Can play MP3 format music stored in the TF card or USB disk Music can be played from the point where it stopped when you switch off the radio use Repeat model: ONE: repeating the current one MP3; FOLD: repeating the MP3 of the current folder; ALL: repeating all the MP3 Package Includes 1 x Retekess PR11 radio 1 x BL-5C lithium battery 1 x USB charging cable 1 x English manual. Am fm radio MP3 player DSP crispy sound. LCD digital display with backlight. If you are looking for small size, combined with superior sound, this PR12 am fm radio will do. If you want a walkman radio,but you worry they have no built-in speakers,this PR mini radio will do. FosPower’s BTS20 portable wireless Bluetooth speaker gives you 5 different ways to listen to music. This wireless Bluetooth speaker can be used within 33ft/10m of the device. 5 Music Sources Wireless Bluetooth speaker. Retekess V-115 portable radio with all features you need: FM/AM/SW band, and also have 3 record mode, bass sound music player that can play MP3 and WMA files. You can record your favorite music or talk shows on the radio, and can record the external sounds with the built-in microphone. As a speaker, it can play music from TF / SD / MMC card and U drive. [TF / SD / MMC Card & U Drive]. With high quality FM Radio signal, mini radio speaker can search channels automatically. Number buttons are for MP3 selection and FM Radio station easily. Plays mp3 music. Simply copy/paste the mp3 files from your PC to the MP3 player and you are ready to go. Display:Mini LCD screen. Music Equalizer: Natural, Pop, Rock, Classic, Jazz, Soft, DBB. Supports USB 2.0/1.1. Output Power: 3W (max). With high-quality FM Radio signal, mini radio speaker can search channels automatically. Number buttons are for MP3 selection and FM Radio station easily. Direct manipulation and get started quickly. Output Power: 3W (max). With high quality FM Radio signal, mini radio speaker can search channels automatically. Number buttons are for MP3 selection and FM Radio station easily. Direct manipulation and get started quickly. Travel sw radio with mp3 player. 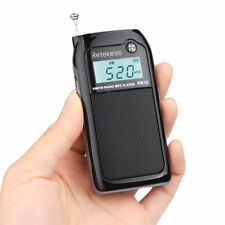 portable radio with bass diaphragm,and you can search the radio station by Automatic and Manual,also can direct input radio frequency to search. Compact world radio receiver. HiFi lossless sound quality highlight super bass and high pitch in music world. Besides, clip design is convenient to clip on the belt, on the pocket to prevent it from falling down. [HiFi Lossless Sound Quality]. Mini Digital Portable Music MP3/4 Player TF USB Disk Speaker FM Radio Blue. Supports TF card, USB flash disk, FM radio, etc. Build-in high sensitivity FM radio frequency module, the signal is excellent. As a speaker, it can play music from TF / SD / MMC card and U drive. [TF / SD / MMC Card & U Drive]. Loud sound and high fidelity sound quality is perfectly suitable for the aged. It’s also available for earphones connected with 3.5mm earphone jack.